California Foundation Works – Los Angeles Ultimate Yard Drainage Service! WATER POOLING AROUND YOUR HOME? WATER IN OR AROUND YOUR FOUNDATION? We Provide Contracting Services for Commercial and Residential Clients Who Wish to Address Drainage Issues With Their Property. As One Southern California’s Premier Yard Drainage Experts, We Install French Drains, Drain Boxes & Catch Basins, Flo-wells or Other Drainage Systems. If your home or business property has yard drainage issues, our team of drainage experts can help you find a solution that is both cost-effective and efficient. We will perform a full inspection to help you identify the source of the problem, then work to craft a solution that is tailor-fit to your budget and your individualized needs. As one of Southern California’s premier yard drainage experts, we approach each job with the same standard of excellent craftsmanship that our customers have come to expect from us over the years. We have years of experience serving the Los Angeles community and have established a reputation for superior yard drainage service. We can help you install French Drains, Drain Boxes & Catch Basins, or any other drainage system for your yard. One of the most common drainage applications, French Drains channel water away from the crawl spaces underneath your home to prevent it from pooling it up. These should be installed along the perimeter of your home’s foundation and underneath the crawl space floor. If any water should seep underneath your crawl space it will be directed away from your home by the French Drain system to prevent pooling and possible water damage. 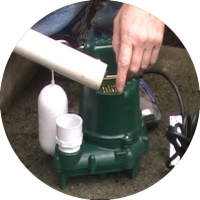 These are frequently installed in a basin underneath the crawl space, and are used to pump water away from the home to prevent pooling or possible foundation damage. Similar to French Drains, these drainage systems are installed around the foundation exterior. The process involves waterproofing of the foundation walls, digging the trenches, and filling with gravel to facilitate smooth drainage. Our talented and highly trained team of experts outperform consistently outperform other drainage systems contractors; we can do it all, and we do it well. 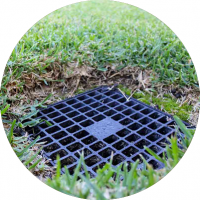 We can install Rounded Grate, Pop-Up Emitters, Atrium Grates, Catch Basins, Flo-Well, Trench drains / Channel drains, or other drainage systems, and we also offer soil grading service! At California Foundation Works, we strive to offer superior service to the other exterior drain systems contractors in the greater Los Angeles area. 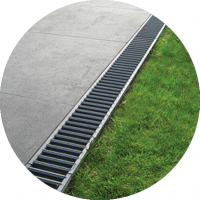 We work closely with you, the customer, to ensure our exterior drain systems are tailor-fit to meet your individual needs. Exterior drain systems can seem like an intimidating construction project to many homeowners, but don’t need to be a major headache. 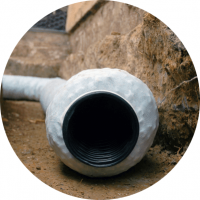 Our exterior drain systems experts will guide you through the entire decision-making process and will keep you informed on the progress of construction. 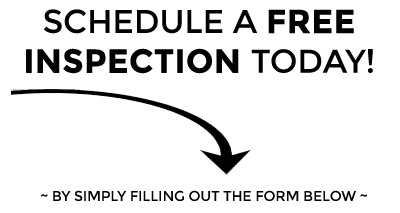 We always perform a no-cost initial inspection, discuss options with the client and provide a free estimate. We’re always happy to answer any questions or address any concerns that our customers might have. California Foundation Works strives to help homeowners in the Los Angeles Area keep their loved ones and investments safe, one household at a time. We understand that the safety of a home depends on the integrity of its foundation, we specialize in foundation works, repairs, installations, and replacements of all kinds, along with our wide array of services as one of Southern California’s foremost drainage systems contractors. I just had some work done to my yard drainage system, Juan and his crew were early for the appointment, coordinated time with me the day before, and got to work and done in a timely matter. Really professional crew, I would refer these guys to everyone who is in need of yard drain work done before winter. Great experience and well deserving of a great testimonial. I needed my yard drain inspected and replaced because I saw huge amount of water pooling area around my yard. 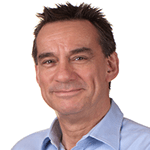 Brian arrived on time, was extremely polite and provided great recommendations on the recommended repair. I would highly recommend Them! I hire CFW as my drainage contractor for my new residential rental property. They work really quickly and their crew was extremely helpful the entire time. There is nothing better than a company that provides a seamless process, stick to their prices and complete everything perfectly. As an out of state owner, I can't explain how important all of this was for me. It was a great experience! For a Free* Drainage Estimate, Call California Foundation Works today!